The theory which Mr. Darwin then offered, so as to include every kind of [reef] structure, is simply that as the land with the attached reefs subsides very gradually from the action of subterranean causes, the coral building polypi soon again raise their solid masses to the level of the water; but not so with the land: each inch lost is irreclaimably gone:—as the whole gradually sinks, the water gains foot by foot on the shore, till the last and highest peak is finally submerged. Darwin observed that coral polyps can only survive at shallow depths, but that the waters around coral reefs are very deep. Coral atolls, he argued, originally formed around volcanoes which rose above the sea, but which gradually sank below the waves. As the volcanoes sank, the polyps continued to build new coral on top of the earlier corals that sank with the volcano. It is a wonderfully simple theory, and similar reasoning can explain all the different types of coral reefs. And the clever thing was that he devised his theory aboard HMS Beagle, before he ever set eyes on a coral reef. In a foretaste of what was to follow with Darwin’s theory of evolution, many contemporary experts rejected his theory of coral formation. Indeed, it wasn’t until the early days of the Cold War that direct evidence was obtained of volcanic rock beneath atolls. In preparation for atom bomb tests on the Pacific atoll, Enewetak, U.S. geologists dug a 1411 metre deep borehole into the coral and eventually hit basalt. 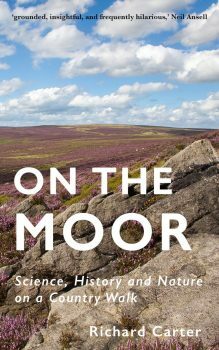 The delighted scientists immediately erected a small sign next to the borehole which read “Darwin was right”. 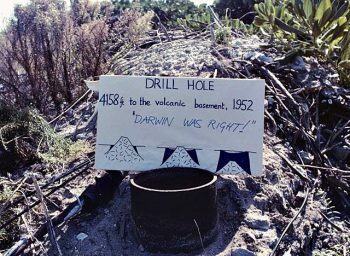 ‘DARWIN WAS RIGHT!’ Borehole, Enewetak atoll. Photo cc. by Flickr user Darkroom Daze.